Residential Land/Plot in Ponneri Near Velammal International School and Ponneri Railway Station @ Rs.898/- Per Sq.ft. 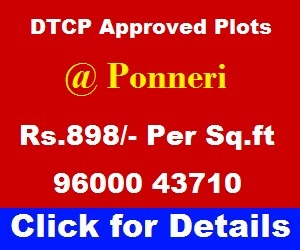 DTCP Approved Plots. Gomathi Amman Nagar. Call: 9600043710. Dear Friends our company going to launch its new project in Ponneri on 26th August 2018 (Sunday) near Ponneri Railway Station. Site Visit Starts @ 8 AM Sharp. For Site Visit and Plot Booking Call: 9600043710. Save My Phone Number in Mobile Phone and Share this information with your friends and relatives. Thank you. I request all my friends to read the details about upcoming Ponneri Smart City Project and Pulicat Lake in this website. Our company launched several project in and around Chennai. Frankly speaking our company launched more than 108 project and it is 109th Project. Our company is one of the best plot promoter in North Chennai. Our company is 28 years old company and ISO Certified Company. All documents are cleared. If you register your ponneri plot within 15 days from the date of site visit you will get Free Registration, Free Individual Patta and Free EC. So confirm your site visit now. There are more than 1000 houses around our Ponneri Layout. All roads in our layout are Thar Roads. 5 Minutes to Ponneri Railway Station. Walkable Distance from our layout. 10 Minutes to Velammal International School. 5 Minutes to Ponneri Bus Terminus. From Ponneri you can go to Thiruvallur, RedHills, Koyambedu Bus Terminus, Pazhaverkadu, Kanchipuram and other parts of Chennai. 5 Minutes to Ponneri Main Market. Lot of Hotels, Hospitals, Shops Near Our Ponneri Layout. Ponneri going to become SMART CITY soon. Already work started. Best Place for Investment and Building House. For 1500 Sq.ft Plot – Agreement Amount – Rs.1,00,000/- only. If you pay balance amount in 30 days you will get Free Registration, Free Patta, Free EC and Rs.15,000/- Worth Free Gift. If you pay Balance Amount in 3 Months then Registration and Individual Patta Cost is yours. I personally request all my site visitors and customers to read all the below Three Posts fully. Please save my phone number in your mobile phone. Share this information with your friends and relatives. Thank you. Share this post with your friends and relatives on social media. Leave your comments below.